I am one of so many who received a drop from the ocean of causeless mercy. I was a young student of Early Childhood Education during the mid-seventies. I was fascinated with the often unseen, underlying psychology that seems to be influencing our lives to such a great degree. I wanted to dedicate myself to learning how to support positive influences in young children's lives, during the formative years, when they are forming their characters. One of my favorite pastimes in those days was to philosophize with my friends about things unseen, and the meaning of life and death. The conclusions were always the same: there is so much more than we can see. What is it? What does it mean? What is true? What and whom can we trust? So many questions and never any answers! Having been raised in a Catholic environment, I was familiar with the Bible, but had never really read it. I decided to give it a try. I found it difficult to get through. Kind of dry. I came out the other end with even more questions and still no answers. I bought as many religious and philosophical, second-hand books as I could afford on my tiny student budget. In my trendy neighbourhood, I sometimes spotted some very spiritual-looking people, all dressed in white and wearing white turbans. They were obviously into some kind of yoga or meditation. I was curious and wished I could meet them; but I felt too shy to approach any of them directly and could think of no way to get to meet them. I also sometimes noticed groups of noisy, orange-robed people with bald heads and ponytails, jumping up and down on street corners. I wondered why they wanted to make such a spectacle of themselves. It didn't occur to me that they might be part of a spiritual community. One Sunday morning I woke up and soon remembered that it was the morning after an enthusiastically attended house party. The house was a mess, overflowing ashtrays everywhere and no food anywhere in sight. My brother, a pre-med. student, had repeatedly offered to pick me up on his way to the Hare Krsna Temple to try out the free food. I had been able to avoid the privilege until then. But that Sunday morning I decided that today was the day. I picked up the phone and asked my brother to swing by on his way to the temple. I was finally hungry enough. Although I wasn't really interested in exploring the Krsna philosophy, I wanted to check out the temple to make sure that my brother was safe there. I entered the temple and witnessed the kirtan, but was determined to remain an observer. No sound passed my lips, and I also didn't notice any deities on the altar. All I could see was thousands of flowers. A very friendly and extremely pregnant devotee woman sat with me during the feast. She was so radiant! I thought she was the embodiment of the beauty of pregnant women. But when she started to eat her juicy subji with her fingers, I quickly had to look away. My conclusion at the end of that evening was that the Krsna Temple was okay and I could safely support my brother in pursuing Krsna Consciousness as his path. As for me, I just went on with my life and put the books someone at the temple had given me on my shelf for possible future reference. I was pretty busy with classes, socializing, and tending to my "can't live with him/can't live without him" relationship with my boyfriend. A few months and many interesting but disturbing experiences later, I found myself taking a long look at my life. I seemed to have arrived at a place full of pain and confusion, and I wondered if there were any alternatives to the choices I had been making. I decided I needed to add a spiritual element in my life and rather than go back to church or begin yet another search for something new, I would start to go the Sunday Feast every week. This time, when I entered the temple, I was overwhelmed by a sense of deep familiarity, relief and home-coming. 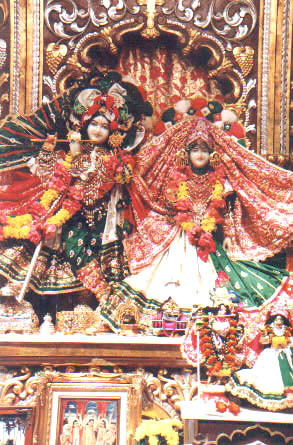 I saw the beautiful forms of Radha and Krsna on the altar and felt the mercy of their compassionate glances. I chanted my heart out during the kirtan and danced in the back with the women till the very last note had sounded from the harmonium. I was completely absorbed in transcendental ecstasy and I wished I didn't have to leave. I came back every Sunday and the devotees became my best friends. I found that every time I came to the temple, I didn't really want to leave. I stayed overnight once in a while, at the brahmacarini asrama, and was thrilled to wear a sari and go to mangal artik in the morning! I started to chant a few rounds and read the Bhagavad-gita. Suddenly, for the first time ever, there were answers to go with the questions. Everything I inquired about was illuminated by the words found in the ancient Vedas, which were translated and brought to us by A.C. Bhaktivedanta Swami Prabhupada. It was so refreshing to finally be able to make sense of some of life's mysteries! Some of the information was completely new to me, but often what I heard struck a chord, deep inside me that seemed to already know. Vague beliefs I had, such as reincarnation, were validated by sound logic from the Vedic Scriptures. I barely managed to graduate from college that year. My brother and I made a pact to wait for each other till the end of the term. That spring we both moved into the temple and became some of the very last disciples to be initiated by Prabhupada before he disappeared from our sight. I accepted all this mercy as if it was my birthright and enjoyed life in the temple for about a decade. Krsna sent me a beautiful devotee to be my husband and we had two beautiful daughters together. We went through ups and downs and many changes and I guess we lacked the maturity to be able to bear up in the face of the obstacles we perceived on our path... Next thing I knew, I was back in the "world." I almost forgot Krsna for a while, but he seems to have a way of bypassing all kinds of heavy defenses and entering a steel-framed heart when you might be looking the other way. I know that in this life I will never achieve the perfection of bhakti. I have so much left to learn, it will take innumerable life times. So much false pride, ignorance and rebelliousness to overcome! Yet, I know, once having set foot on this path, there is hope, even for me. And I know Krsna is in my heart every step of the way!